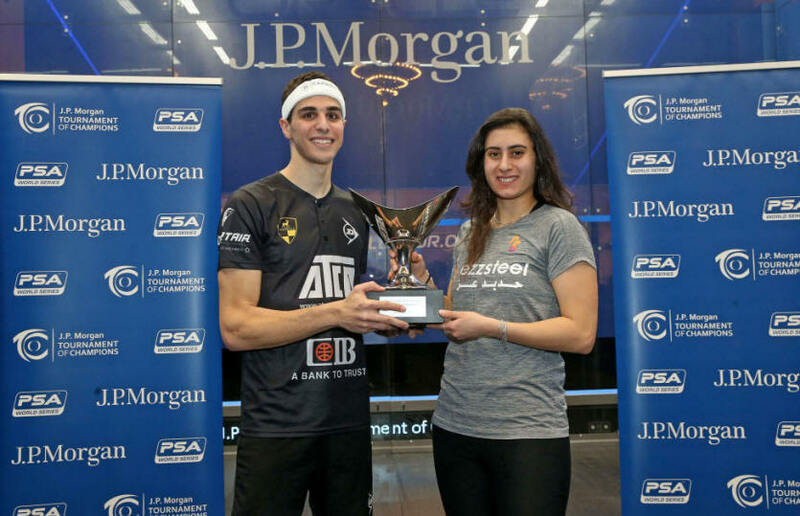 Egyptian duo Ali Farag and Nour El Sherbini are the 2019 Tournament of Champions winners after respective victories over compatriots and World No.1s Mohamed ElShorbagy and Raneem El Welily. Nour is the first lady to win the even three times. 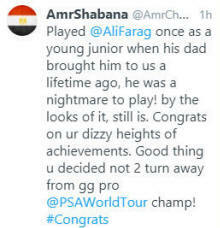 Farag will now replace ElShorbagy at World No.1 on March 1st after prevailing in one of the most dramatic finals ever witnessed at the Tournament of Champions. The world No. 1 appeared to be on track for a fifth win against the Harvard Graduate, pulling out a tight first game—including a mammoth two-minute rally at 10-10—to go 1-0 up. 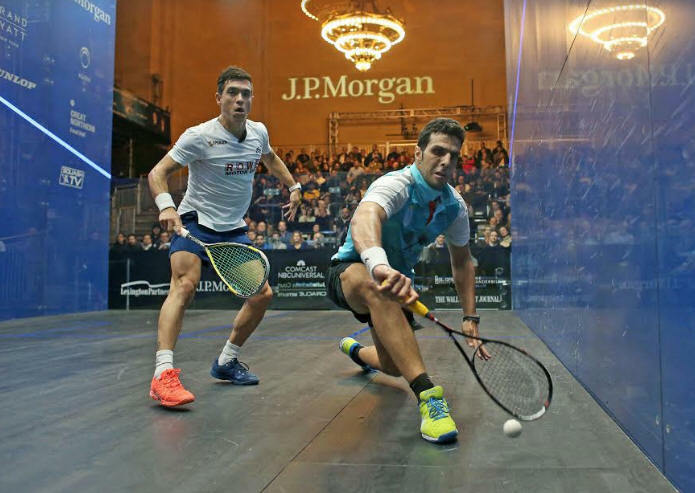 In the second, a string of Farag errors saw ElShorbagy pull away from 6-5 to win the second 11-6. 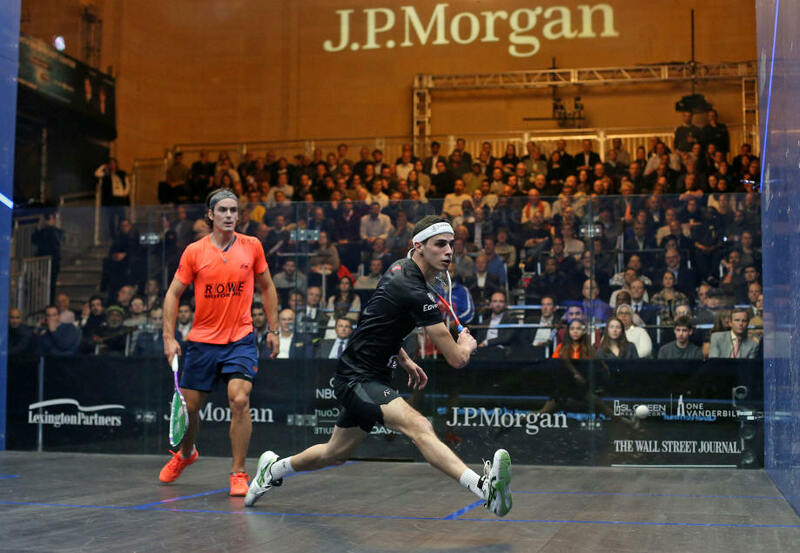 The match turned on its head in the third game, however, when Farag found himself 6-2 down, and went on to win the next nine points through winners and ElShorbagy errors. The fourth game proved to be the quickest of the match as a startled ElShorbagy quickly fell 11-3 and took a injury break between games as a medical team examined his calf. 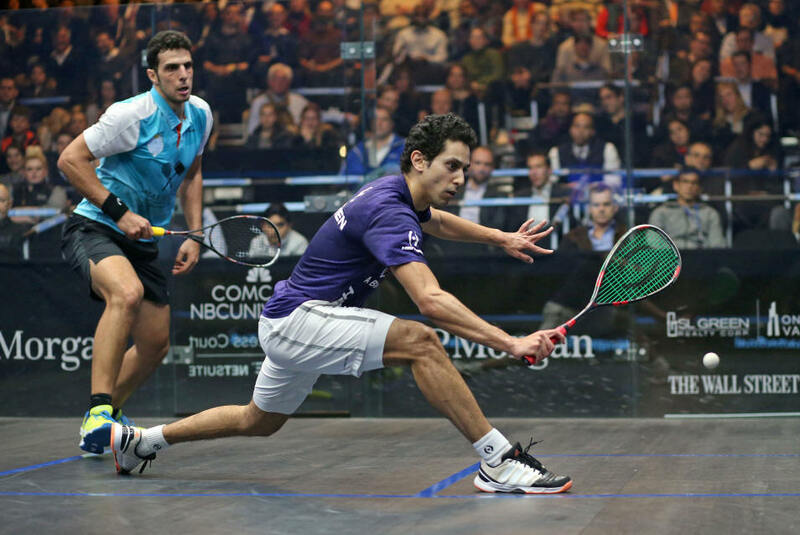 Despite any physical discomfort, ElShorbagy returned to court and pushed Farag in an entertaining climax of the tournament. 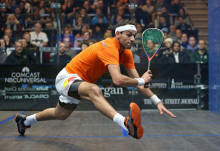 At 8-all, Farag hit a nick off a return of serve to the thrill of the crowd. 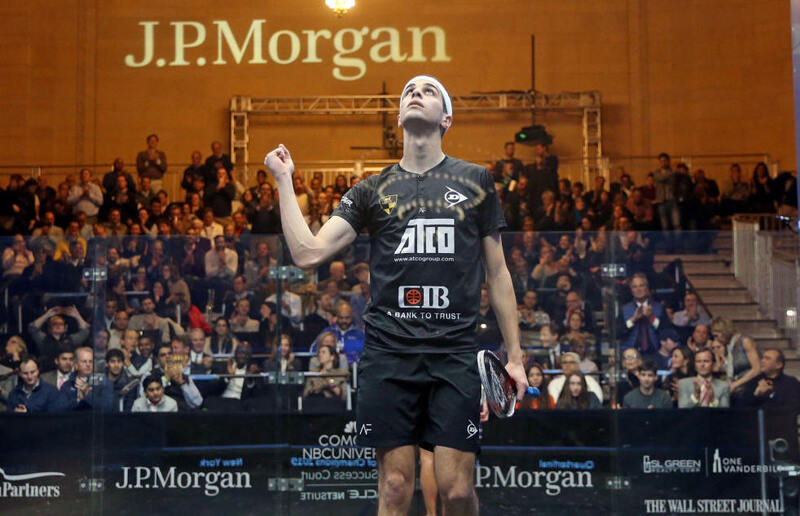 Match ball up, Farag caught ElShorbagy in the front of the court to earn a stroke call on match point to lift his first Tournament of Champions trophy and the 14th PSA title of his career. 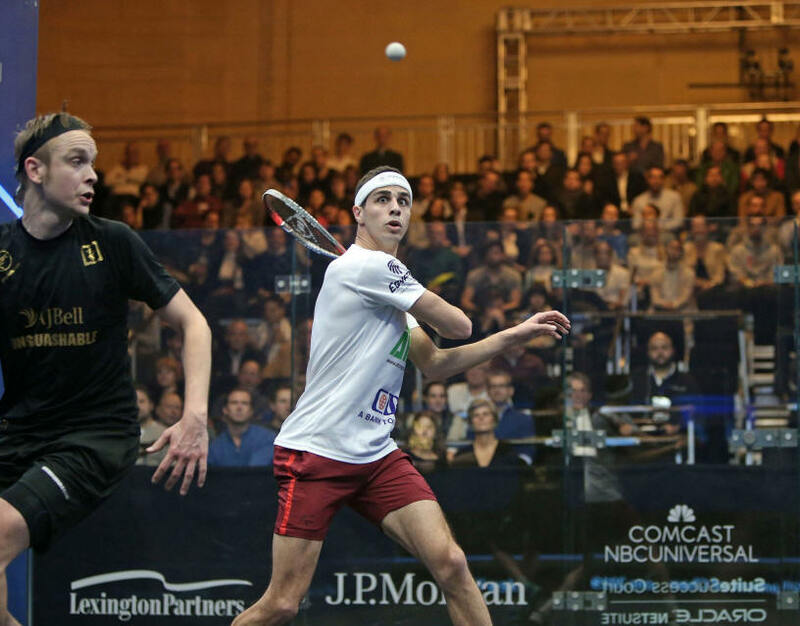 "It’s been a dream of mine since a very young age to reach that No.1 spot," said Farag afterwards. "To do it in such a fashion in front of so many greats of the game, in front of the love of my life and my parents watching at home, it couldn’t get any better really… It was very emotional. "Mohamed is such a warrior, he never gives any points away. It's been one of the biggest spectacles for the sport, and to be played in such a clean spirit is a great showcase for our sport." 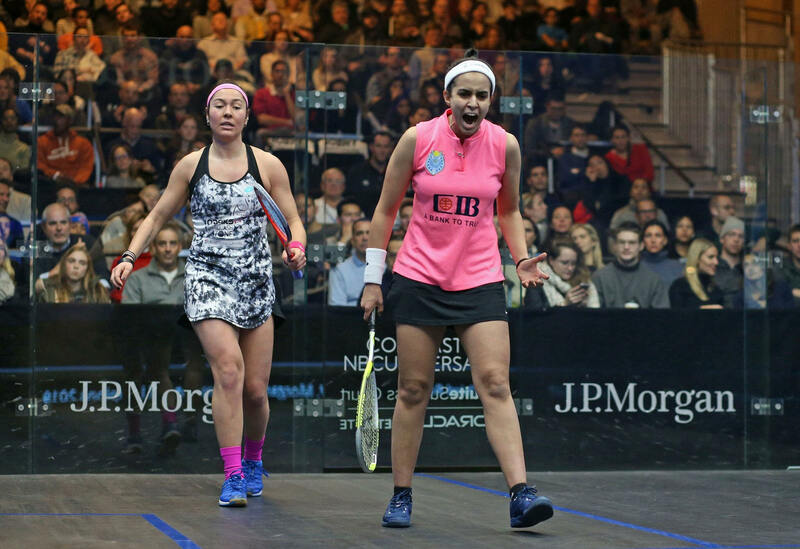 In the women’s event, El Sherbini and El Welily were meeting for the first time since the latter had ended the former’s 31-month reign at World No.1 last month and El Welily - the 2015 Tournament of Champions winner - came into the match with a narrow 10-9 lead on their head-to-head record. 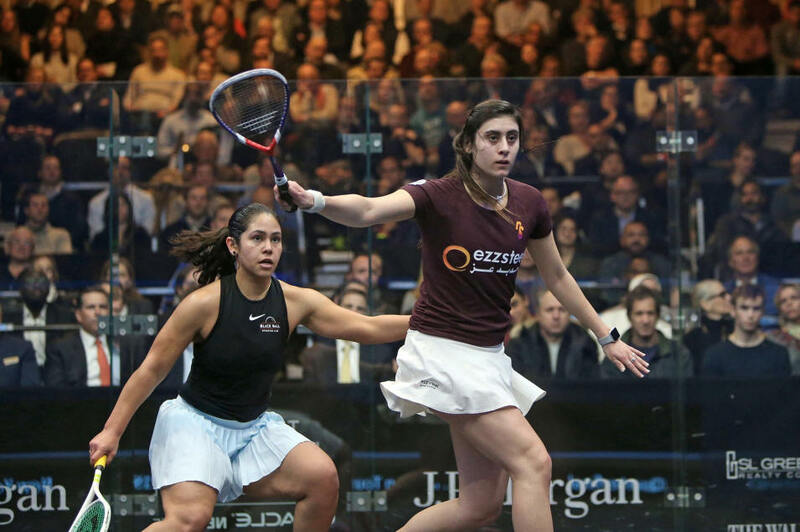 But things went El Sherbini’s way this time around as the 23-year-old put on a masterclass of attacking squash to lift her 18th career PSA title, which is her first of the season. “This is my lucky place, this tournament was my first ever [Platinum] win and now it’s the first one I’ve won three times,” said El Sherbini, who also won the Tournament of Champions in 2016 and 2018. “I think the difference between our last encounter and today’s encounter was my mental state. I was a bit sharper today than I was yesterday, at least. Lots of positives to take and I am very happy to finish this match in three. 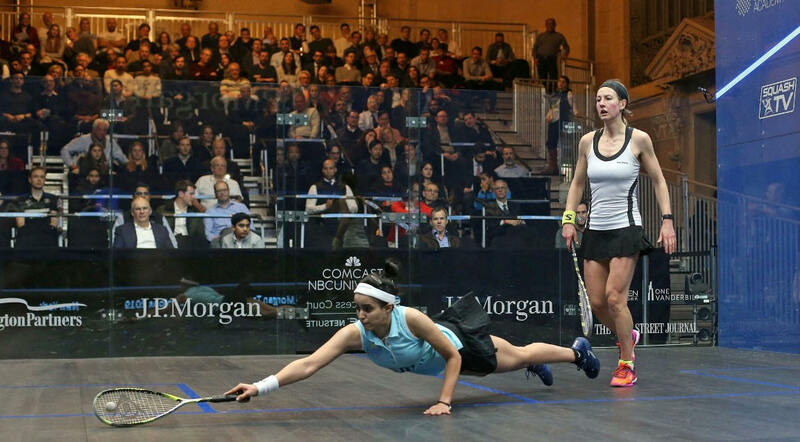 Nouran is a very tough player. As you can see, she strikes the ball really hard and she finishes it nice and clean, so it is never easy against her so to come away with a 3-0 win against her is definitely a huge plus. You try to fight back and you try to be on your toes because she goes short really well. “If you then play a loose shot from that short shot then she is going to hit it for sure. So, you try to do a lot of things with your movement, with your mentality and it is always a hard fight. 'Salma is very talented and very dangerous. We have been growing up together and we have played for the same club for almost ten years, I think. We play a lot together, and she beat Laura yesterday, which was a very good win for her, and I was sure that she would come today and want to do the same and be hungry for more. Winning the first game made the difference, I think. I was really glad that I snuck it in the end. Anything loose in the middle, or in the back of the court, she is going to kill it. I was always steady on my feet, ready for everything, because she was going to kill it from anywhere. I was making sure that I was ready and trying to make better shots from her. This kid is going to beat us all one day, you know. We have played four times now, and all four have gone to five games. 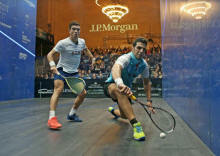 He beat me the last time, he just showed what a great player he is and there is no doubt he is a future No.1 of the game. He is going to be the ambassador for our sport one day. He is a great guy, a great player and I am just going to try and keep him away from that World No.1 spot for as long as I can but I am not sure how long I can do that for. Today the match was very similar to Qatar. He was 2-1 up and I came back to 2-2. In Qatar, he was the one who had that lead at the beginning of the fifth and then pulled through after. This time it was the opposite. I had the lead in the fifth game and I feel I learnt a thing or two from the last time I played him, but he is young and hungry and fast and he plays everything. He is a very good player, and believe me, I don’t know how I won today. When I was 2-1 down, I thought I was out already but I thought that if he was going to win, I am going to make him push a bit harder and luckily it went my way at the end. Everyone plays differently. Our match was fair and clean, and that is the way we want our sport to be played. I am glad that we played with the intensity, how close every game was. I think we both kept the match fair, but I feel like we both played a hard match in the right spirits. “It means the world to me, of course. Simon beat me the last two times last season, and he is now the World No.3. He has improved a lot, and he was always top 10 but now he is even much better than he used to be. He is the defending champion here so it was a very tough match, of course. He is very dangerous in the middle of the court. He is a very good attacker and he attacks from the middle of the court very well. I had to make sure to put him behind me a little bit more and it seemed to work pretty well. I had to be very strong mentally in order to win against someone like Simon, especially a 3-0 win. I had to focus 100% today." 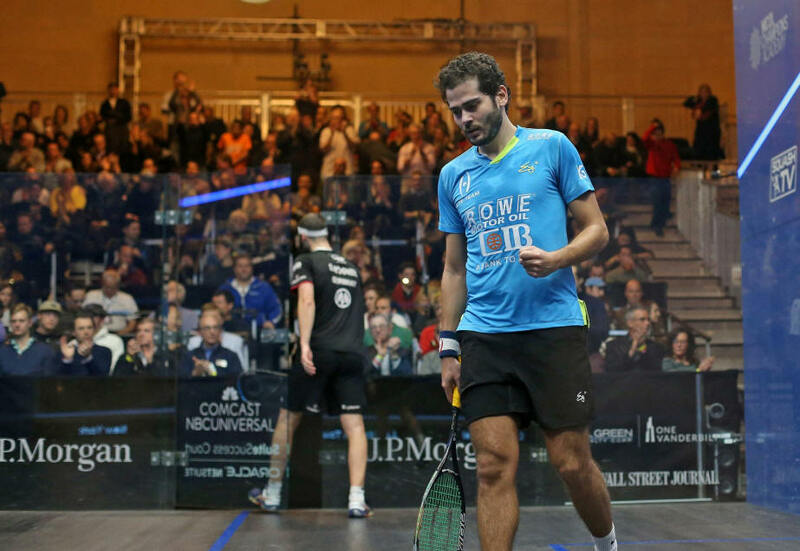 “Omar was my first rival since we were eight or nine years old,” Momen said after winning. We have been competing at the same age group at every local tournament and at every international junior tournament. When I was a kid, I never thought we would be rivals for nearly 25 years. It is just incredible. Each one of us has had ups and downs. Omar has had a tough patch recently, but I am so glad to see him come back and playing this well. He has had some really good results in the past two or three months and it only means that he is on the way up again which is great. Each size has its own pros and cons. With me being average height, my movement is maybe a bit easier. I am not carrying as much weight as he is, but at the same time, he has a bigger reach. It is always difficult for me to get the ball past him. I tried to do that and get the ball past him and move him a little bit around the court so that he would get fatigued. I am quite pleased with my shots today. They were deep enough and in the front corners they were working well. All in all, I am quite happy. I am very happy with today’s performance. I think I played really well and executed the plan the way I wanted. To get a 3-0 win at this stage is very crucial for the next match and I am very pleased with that." “Yesterday’s match was more of a confidence booster. Today I woke up feeling very sore obviously, but it gave me a lot of confidence to be able to get back and win such a tough match. Today I was more relaxed and happy to be on court rather than being too nervous. My mum and dad are always scared when I dive and I am going to get yelled at by them after. I couldn’t resist, I think she tricked me in the rally and I couldn’t let go. I was excited, I thought I was playing well so I thought why not just go for it. In all honesty, I am trying not to do it, but if it is one or two per match, I am alright. I haven’t won a match from being 2-1 down, or being outplayed for a while and to win a match like that gave me a massive confidence boost and it showed today." “Paul has been giving trouble to everyone and he is a very, very tough opponent to play against. You could tell his fighting spirit at 10-3 down in the first game. Most would have just thrown the first game away but he kept fighting back and he got me edgy at 9-10 but it was crucial to win that one in terms of momentum and psychological confidence. I am just happy that I got it and then I think the second was neck-and-neck until around 7-7 and then I ran away with it which was very important as well. Then I got off to a good start in the third and kept my lead so I am very happy. Thank you to everyone who stayed for staying to watch the match. Fitness to fitness, I stand no chance with Paul. This is a testament to him, he is the fittest on tour by far and I could not play his game. “If there is two players that play completely different, it would be me and Annie. We play completely different games. I try to play with high pace and volley, she tries to slow it down so it was very interesting to see who would control it today, but I am glad it worked for me today. I am feeling great. 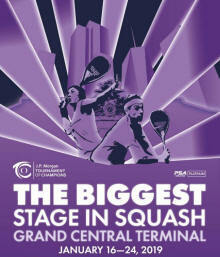 I think last year was not about my squash or my physical training but about my mental state. I wasn’t really enjoying it as much as I did before and when you don’t enjoy the game, you can’t really perform well. I just tried to calm myself down and tried to enjoy it as much as possible because squash is my passion and the biggest thing in my life. How good was she today? She was unbelievable, absolutely fantastic and slotting shots all over. I had to retrieve a lot today and I’m really glad that I managed to push myself after that first game. I was a bit flat and she was really fired up. I’m reallyhappy with how I came onto court in the second game and with the way I switched the mental side around. It’s never easy against Nouran, she’s a good friend and a fantastic player, so hopefully it will be a good match for the crowd. Ever since the draw came out, I’ve been thinking about this match. It’s a very, very hard third round, not just because Amanda was in the top five, but because we were always junior rivals, and it’s very hard to play someone you grew up with. I was struggling to keep my focus, I was struggling to stay disciplined, and whenever I was half disciplined, she was just killing it and she was finding her marks very well on the court. “t took a lot of fighting to be able to be in the match. I had Ali and Raneem in my corner, the World No.2 and the World No.1, so they were just trying to keep me disciplined, encourage me and thankfully I fought until the end. “I think I was playing well from the start of the match and I think I am feeling better today and more comfortable on the court. “I have been working towards this for so much time now. After Hong Kong, when I wasn’t happy with my performance, I had a good time training with my coach, and my physical coach in London. When I saw the draw, I saw that if I was going to play Laura, the worst time to play her is after a bad loss so I know she wanted to come to this tournament and do well. Every time I step on this court, especially in this amazing venue, I get a bit nervous. Today, before the match, when I talked to my squash coach, he told me about the plan and then at the end, he told me ‘you know what, forget everything and just dance on court’. When I started playing, she was already in the top 10, she was playing really well and I was watching her every single match. When she had her injury, we were meant to play at the British Open in the first round, but she had her ACL injury, so unfortunately we couldn’t play. I’m really happy she’s back and she’s one of the toughest opponents to play against because her game plan is to never give up. 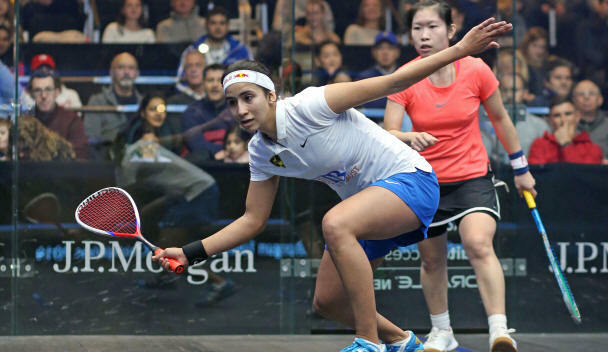 All the eyes were on the match Yathreb Adel/Laura Massaro - as the Egyptian beat the English a few weeks ago in Hong Kong. But the English had learn from their last encounter and was able to contain the Egyptian 12/10 in the third. Another Egyptian awaits for the former world number 1, Salma Hany, who dispatched former Junior World Champ (and future WR1 I'm sure) the extremely dangerous Sivasangari Subramaniam from Malaysia. 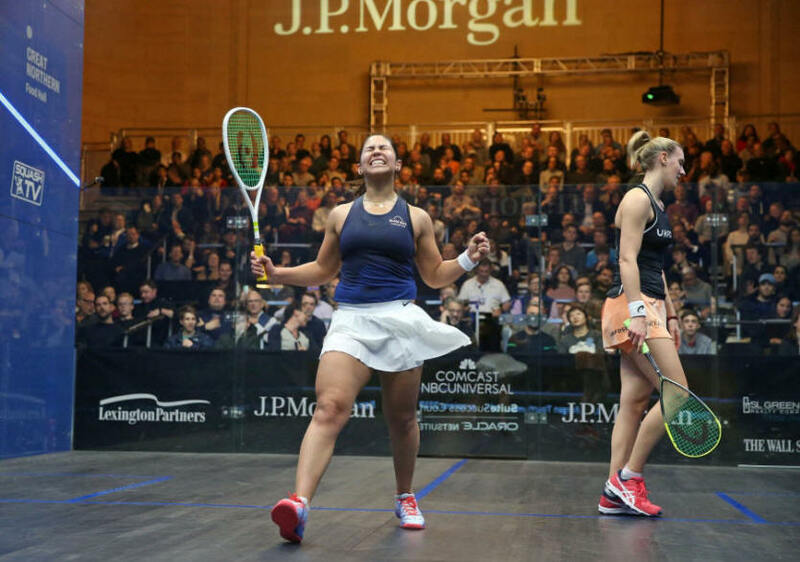 The current World Junior Champ Rowan ElAraby couldn't pass through the experience of a very motivated Nicol David, she bowed not without a fight, 13/10 in the 3rd. 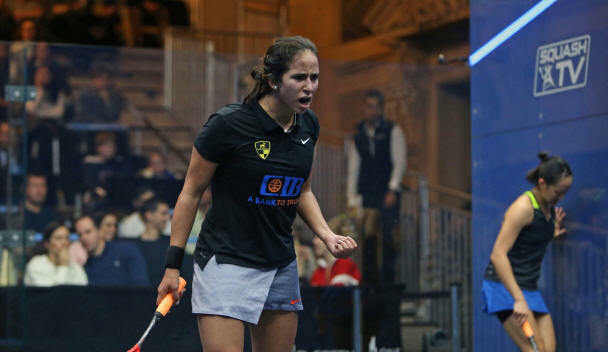 Two all Egyptian matches, Raneem El Welily against Mariam Metwally, Mariam never really finding a way to get in front of the World number 1, 3/0 Raneem, and Nour El Sherbini versus Hania El Hamammy, with Hania causing a few serious trouble for Nour who prevails 3/1 in 49m. As for the Men, Karim Abdel Gawad was able to contain the Return of the Fearless Fares Dessouki with his usual "why should I win in three when I can win in 5" routine bless him. 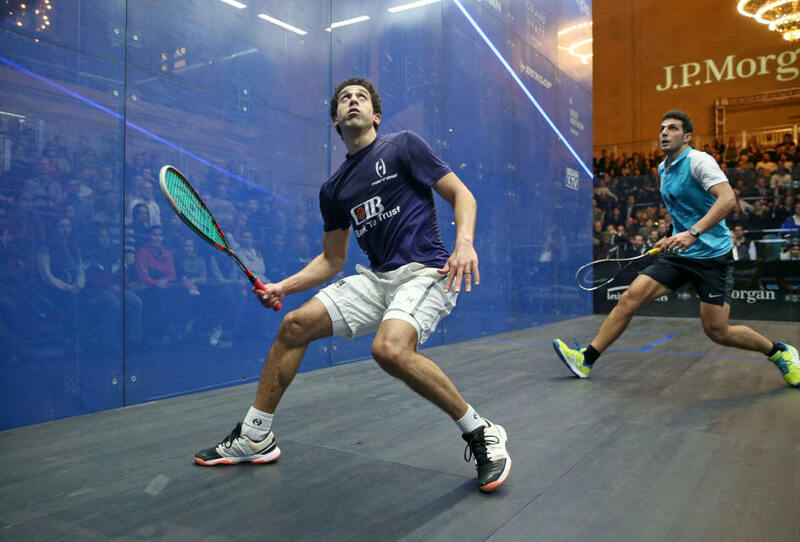 Omar Mosaad keeps on with his great form and despatched of Greg Lobban without losing a game and looks a serious contender. World number 1 Mohamed El Shorbagy safely through against Zahed Salem despite a big fight in the last two games, 12-10, 11-9. "Mariam is a very dangerous player, she is very skilled. As you can see, she just dunked twenty nicks in a row so I had to be on my toes. I had to watch very carefully, and I am just pleased to be through, especially after that performance. When I got to No.1 I was just trying to enjoy myself on court and to do my best in every single game. To stay in the same form, I have to do the same things that got me to No.1, so I am still trying to enjoy it as much as possible." "He had ACL surgery in September and now he’s coming back really strong. He’s always been a very good player, but now he’s even better. He’s a fighter on court and I have a lot of respect for him. He didn’t come back too quickly, he came back when he was ready to be on court. When we’re out for a month or two, we struggle. Last season, I was on court and playing but I wasn’t doing really well. 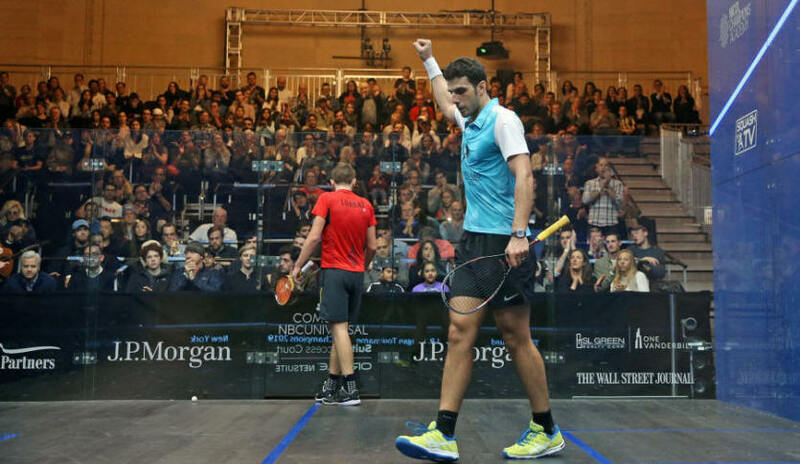 To come back after ACL surgery and to play such good squash in this tournament and the one before is unbelievable. In my previous match, I felt like I wasn’t ready to be in this tournament and I felt like I wasn’t feeling the ball on the racket. I was moving badly, I was playing bad squash, but I think that Makin's injury gave me another life. It made me feel like I’m playing another tournament and it’s another first round here at the ToC. 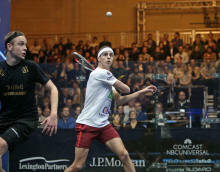 “The first game, I was nervous as this match was important to me and Greg but I tried to play my game. Greg was leading every point and he put me under pressure and I think I did very well, especially at the end of the first game. It is not easy to play my game because he changed his tactics. Before the match I went through my tactics with my coaches and I was trying to follow my plan. Sometimes I was down, sometimes up but I am really happy to win. I am really happy to be here. It is actually the first time I have made the quarter finals here. 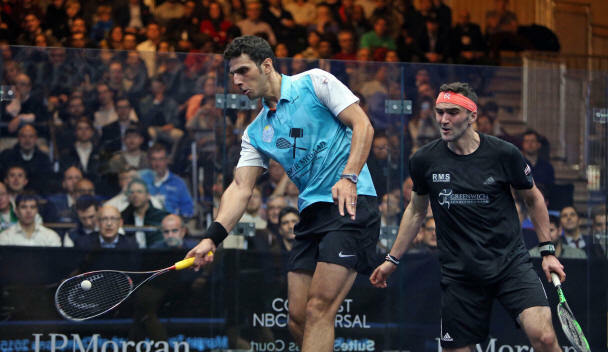 In June 2016, Omar Mosaad reached his best ever ranking, number 3. Strangely enough, it was the last season where he performed at the highest level. 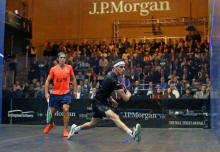 I remember his final in Canary Wharf against Mathieu Castagnet. It was like his body, his mind went as far as he could to overcome the tragedy that hit him and his family (when his mother and sister died in a car crash at the end of July 2015). I remember what I believe to be the turning point in his career. Wadi Degla's worlds, round 2, losing 12-10 in the 5th in 102m against Wan. Since then, it was like Omar had lost the mental believe he was good enough. And although he was working as hard as ever, he just couldn't find his shots at crucial times anymore. And kept losing, and losing, and losing again. To reach WR31 in October 2017. Then the Miracle of Love. 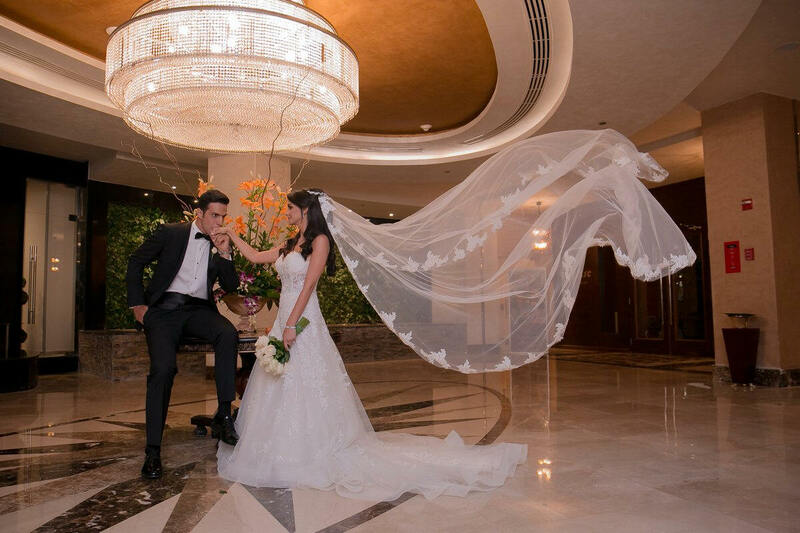 Yes, I am a romantic, but since Mosaad got engaged to "the Best Dentist in the World" Nouran - who is now his wife - it was like he started believing in himself again. And slowly, baby steps, he started winning a few matches, and as Malcolm Willstrop would say, "getting back in the winning habit". In Blackball, a month ago, Mosaad beat Rodriguez from 2/1 down, 11-8 in the 5th in 79m. This time round, on a very warm court - Blackball was freezing - same length match, 11-9 in the 4th (81m). He confirmed he is back on top, and that he is now a threat to all in the top 10. “I am really happy because I did a good job today, I think, and Miguel as well. It's not easy to play Miguel. Especially because we have had a couple of matches that were very tough. I needed to be strong mentally today, I pushed 100% today and I want to thank my coaches and my wife, who is supporting me today" said Mosaad. 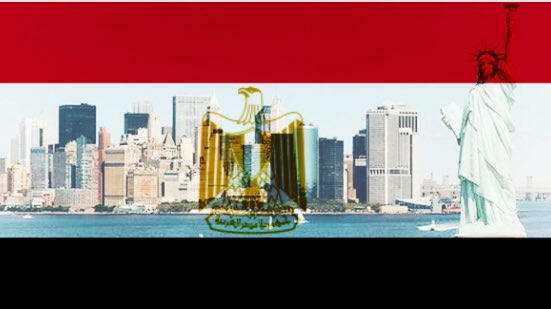 During that second round, we lost 2 Egyptians. 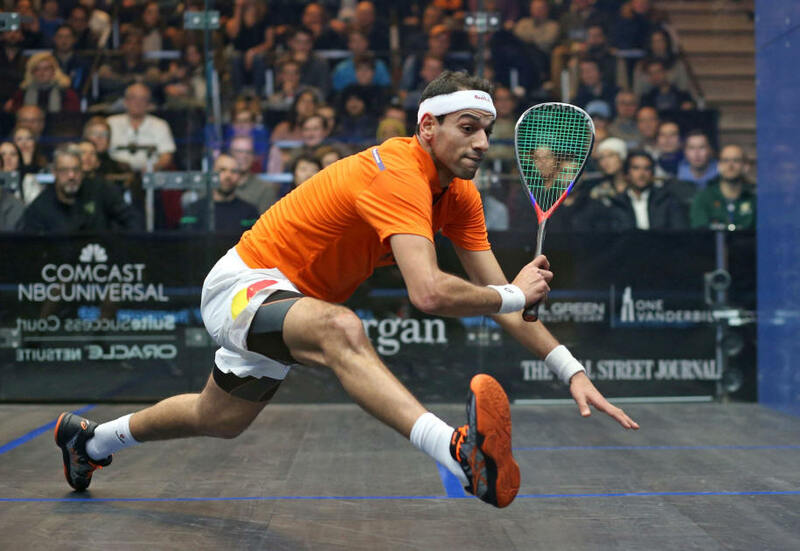 One was Marwan ElShorbagy - 3/1 to Diego but still bagling his opponent 11/0 - Marwan will take a little while to get his match fitness back - the other one was Youssef Soliman - against Daryl Selby. There was also a victory for World No.4 Tarek Momen, who claimed a hard-fought 3-2 win against World No.10 Mohamed Abouelghar, winning it 10-12, 11-4, 4-11, 11-7, 11-6 in 68 minutes. Tarek will play France’s Gregoire Marche in round three. Zahed Salem was able to contain Ninja Yow, former world junior Champion, 3/1, a solid performance from the Alexandrian. 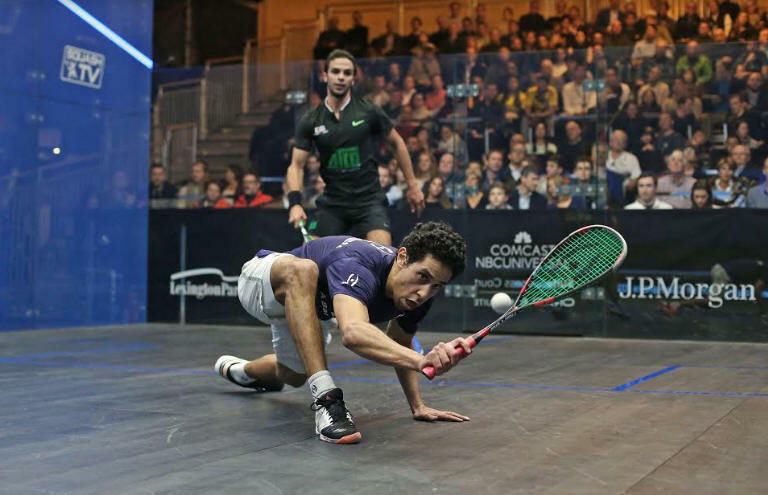 To finish, Fares Dessouky confirms his great form by taking out Frenchman Castagnet 3/1 to set up a third round with Karim Abdel Gawad, who was down 2/0 and 3/4 against Giant Killer Joel Makin when the Welsh twisted his ankle and had to retire. 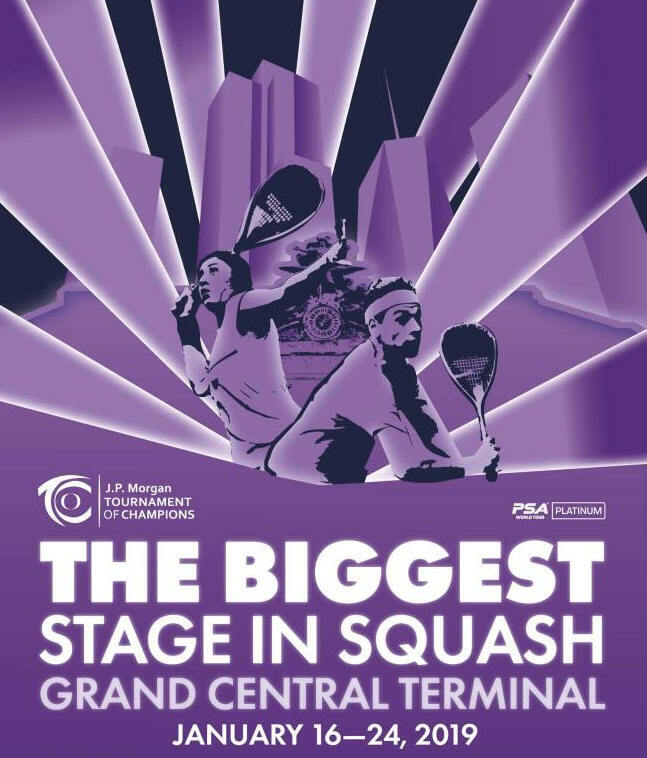 While the Men were having the spotlight on the Glass, the women's first round kick off at three different NY clubs on traditional courts. 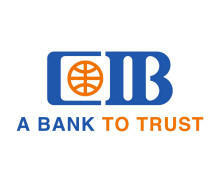 Not an easy task for world No. 33 Zeina Mickawy against BJO GU17 winner USA Marina Stefanoni, only grabbing the match 14/12 in the 4th! She now plays WR4 Joelle King. Hard one too for Mayar Hany, who had the challenge to play former top 10 Low Wee Wern, out of the PSATour after a series of recurring injuries for 21 months. Mayar bowed 3-1, and it's now Nouran Gohar that will have to face the Wee Wern challenge in Round 2. Very tough one for Nada Abbas who was up 2/1 against Scottish Lisa Aitken, but who couldn't close the match down in the 4th despite a huge fight, 15/13, and finally lost 11/6 in the 5th. All went according to plan for the other Egyptians in the R1, Mariam Metwally 3/0, Rowan Elaraby 3/1, Yathreb Adel 3/0 and finally Hania Hammamy, 3/0 in the quickest match, 19m!